shooTag Cat Flea & Tick Repellent tags are the natural way to keep fleas and ticks off your cat. If you have a cat that is an indoor/outdoor or an outdoor cat, you need to keep fleas and ticks off your pet. The pesticides that are in the spot on treatments are harmful for your cat. "Products intended to treat cats and dogs for fleas and ticks kill hundreds of pets each year and injure tens of thousands, the Environmental Protection Agency said Wednesday as it outlined plans to make the products safer. The EPA said it will develop stricter testing and evaluation requirements for flea and tick treatments that are applied to a pet's skin. The agency also will begin reviewing labels to determine which ones need to say more clearly how to use the products. The EPA's effort follows increasing complaints from pet owners that the "spot-on" products have triggered reactions in dogs and cats, ranging from skin irritation to neurological problems to deaths. Cats and small dogs appear particularly vulnerable, the EPA said, especially when given products intended for larger animals." Shoo!Tag Cat Flea & Tick Repellent tags are easy to use - simply remove from the packaging and attach to the cat's collar with the provided split ring...that's it. There are no toxic chemicals. That means there are no side-effects of any kind. 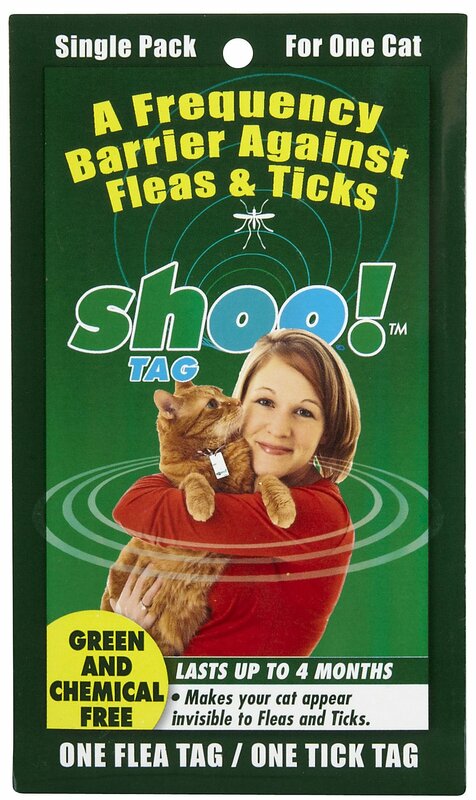 Shoo!Tag Cat Flea & Tick Repellent uses your cat's own bio-energetic field to create a three dimensional electromagnetic barrier around your pet. Each type of shooTag is calibrated to specific animals and specific insects to repel targeted pests. Shoo!Tag products are waterproof (including saltwater). The eco-friendly shoo!Tag is made of biodegradable, recycled plastic and are printed with soy ink. 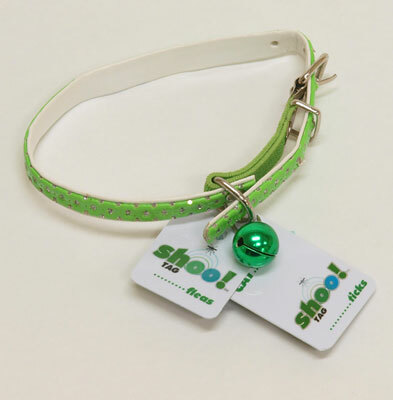 Buy the shoo tag for cats at Mickey's Pet Supplies. Low Price, and immediate same day shipping.